"Fighting is going on and to help us, the army sent some gunships which fired at the militants, killing several of them," tribal elder Malik Younus told Reuters. "We can't tolerate lawlessness in our land. Everyone has to obey our tribal rules and they can't make our land a hub of terrorism," Younus said. As the battle of Bajaur rages with great intensity, the questions are being asked as to the effectiveness and the ultimate outcome of the war on terror within Pakistan's border. Is there a well-conceived strategy behind it? Or is it being done just to get the Americans off Pakistan's back? Is it purely a military effort? Is there Pakistani political will behind it? Are the people of FATA in particular, and of Pakistan in general, being persuaded to support it? Can this battle lead to ultimate victory over terrorism in the region? As far as the people of Bajaur are concerned, Pakistan government has been trying to turn tribal communities there against the militants and government helicopters have dropped leaflets in different parts of Bajaur calling for support, residents have reported. A full-scale war is unfolding in Bajaur agency of federally administered tribal areas (FATA) in Pakistan. Pakistani military, aided by local tribesmen and tribal elders unhappy with the militants, is fighting the Taliban and Al Qaeda militants. There are reports that tribal militias are being formed to fight the Taliban. These militias have the support of the Pakistani military, Pakistani-appointed Political Agents(PAs) and the traditional tribal elders who have been losing their power and influence since the 1980s, first with the Afghan "Jihad" against the Soviets, and then the subsequent arrival of the Taliban and Pakistani military in their villages during his decade. The war is beginning to take its toll on the ordinary people in FATA villages, which may affect support for it in the absence of any effective measures to alleviate their suffering. According to a New York Times report, an estimated 250,000 people have now fled the helicopters, jets, artillery and mortar fire of the Pakistani Army, and the assaults, intimidation and rough justice of the Taliban who have dug into Pakistan’s tribal areas. About 20,000 people are so desperate that they have crossed the border from the Bajaur tribal area to seek safety in Afghanistan. This is the first time in recorded history that refugees are pouring out of Pakistan into Afghanistan. In addition to the growing refugee crisis, there are reports of rising anger and resentment in Pakistan as the dead, wounded and displaced show up right on their doorstep. It is hard to find reliable casualty figures. But the International Committee of the Red Cross has flown in a special surgical team from abroad to work alongside Pakistani doctors and help treat the wounded in two hospitals. This is now a war zone,” said Marco Succi, the spokesman for the International Committee of the Red Cross. It seems that the Pakistani military is attempting to win the support of the traditional tribal elders as part of its campaign to rid FATA of the Taliban and Al Qaeda militants. While winning FATA elders' support is necessary, it will not be sufficient. In addition to serious efforts to alleviate the suffering of the innocent victims of war caught in the cross fire, what is really required is a Pakistani government-led campaign to persuade a substantial majority of Pakistanis to support its efforts against terrorists who have wreaked havoc on Pakistani streets by a series of deadly suicide bombings this year. Pakistan's campaign must emphasize that it is fighting this war for its own existence as an independent and democratic nation free of terror. Pakistan government must demonstrate by its actions that it does care for its people; that it is not accepting dictation from Washington to wage its concerted political and military campaign. President Asif Zardari and other leaders need to communicate, honestly and frequently, with the people of Pakistan on the aims and progress of the campaign in FATA. There can be no victory in this war without winning the hearts and minds of a substantial majority of Pakistanis. In the meanwhile, the US political and military leaders must control their actions and rhetoric to avoid being seen as the instigators of Pakistan's war against terror. The Khyber-Pakhtunkhwa (K-P) government on Sunday approved two new campuses of Islamia College University (ICU) at Parachinar and Sadda in Kurram Agency. In this connection, a delegation headed by Senator Ahmad Shukaib Khanzada, ICU Director Campuses Sikandar Khan and ICU Director Project Development Farid Khan visited Parachinar and Sadda in order to review the arrangements for establishment of the facilities, according to a press release. The tribal elders arranged a function at Shoblan and allotted 1,500 kanals for the project. On the directives of K-P Governor Barrister Masood Kausar, the Federally Administered Tribal Areas (FATA) Secretariat will provide the required funds for the two campuses. The initiative shall provide an opportunity of quality higher education to the inhabitants of FATA. Islamabad: In keeping with the directives of President His Highness Shaikh Khalifa Bin Zayed Al Nahyan to provide assistance to the people of Pakistan and to support technical and vocational educational there, the UAE Project to Assist Pakistan (UPAP) has announced completion of the project to build a technical college at Bajaur in Pakistan at a total cost of $3.4 million (Dh12.4 million). The project was delivered to the local government in Bajaur following completion. The official inauguration of the college was attended by Chief of Pakistan Army Staff General Ashfaq Pervez Kayani, UAE Ambassador to Pakistan Eisa Abdullah Al Basha Al Nuaimi, Abdullah Khalifa Al Gafli, Director of the UPAP, and senior Pakistani officials. The college is built on a 34,000 square foot area. It will provide diploma-level technical education for up to 450 students in various disciplines of engineering such as electrical, mechanical, civil and mining. Seven months after Pakistan’s army launched a massive operation to oust militants from the country’s loosely regulated tribal areas, it is preparing to allow more than 1 million displaced residents to return home. But it is telling them there may be one condition: Giving up some of their weapons. For generations, the Pashtun tribesmen who populate the area say they have considered carrying a weapon outside as important as wearing sandals — and Pakistan’s government has made little effort to stop them. Unlike in most of Pakistan, where there are gun licensing requirements, the tribal belt is semiautonomous, and residents say that has given them a right to keep an array of weapons. Now, though, the army vows it will keep the area clear of militants and bring more order to the famously unruly region. Whether Pakistani security forces succeed will be a key test of the government’s long-term strategy for curbing terrorist attacks. Many analysts are skeptical that anything close to true order can ever be established in North Waziristan and Khyber Agency, and the tribesmen say that is why they are not likely to disarm. Here in northwestern Pakistan, the culture of gun ownership can be traced to what the mostly Pashtun tribesmen call their “warrior instinct” combined with fact they rarely had to look far to find a weapon. 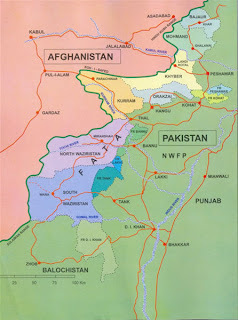 Over the decades, both Pakistan and foreign governments, including the United States, have dumped arms into the area to try to influence the near continual war in neighboring Afghanistan. As a result, it is common for men in the region common to own not only assault rifles but also rocket launchers and grenades. Some tribesmen even claim to possess antiaircraft weapons. Those men say going home without a gun would be like going home without their wives. Many doubt Pakistan’s army can provide protection against Islamist militants, drug-runners and other criminals.